(CNN) – Kendall Jones is just your average college sophomore. She's a cheerleader at Texas Tech, working on a marketing and sports therapy degree. 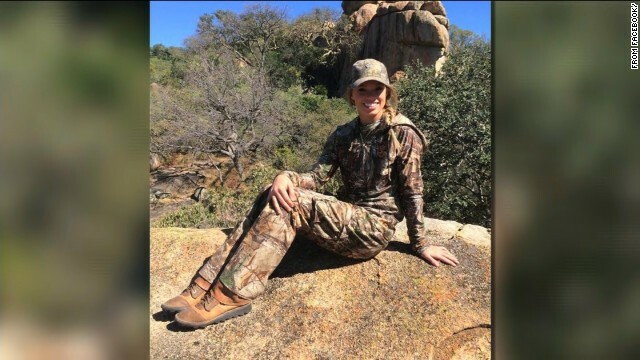 But she also travels to countries like Zimbabwe and South Africa to kill big game like lions, rhinos, and elephants, and posts pictures on Facebook of herself posing – with a big smile – beside the dead animals. This isn't a new hobby for Jones. She writes on her Facebook page that she's "been traveling to Africa with her family since she was 9 years old." And she also describes her first kill, writing "... the first animal I ever shot was a White Rhino with a .416 Remington!! ... I got my leopard, and also took down a hippo to get 6 of the Dangerous 7 at the age of 14!" While it's legal in these countries to "trophy hunt," as it's called, her page has caused an uproar. There are petitions calling for Facebook to take it down, and some over-the-line comments slam Jones, calling her "scum," and wishing she met the same fate as the animals she is posing with. It's also boosted the number of clicks on her page. "When people see a photo of a smiling girl next to a dead animal, they're going to freak out, and stopping them is almost impossible," said Buzzfeed's Ryan Broderick, who reports on social media and wrote about Jones' story. Another one of Jones' posts is of a white rhinoceros, but she hasn't killed it. "Here is the South African Vet administering treatment to the White Rhino I darted during the Green Hunt. The vet drew blood, took DNA samples, took body and head measurements, treated a leg injury and administered antibiotics. I felt very lucky to be part of such a great program and procedure that helps the White Rhino population through conservation," she wrote on Facebook. Broderick says that context will do little to garner sympathy for Jones. "One of the old jokes about the internet is that animals rule supreme. So no matter what, if you're putting up a photo of a dead animal on Facebook, and it's traveling around, you can't slow that down no matter how much you explain why you did it, and especially if you're smiling," said Broderick.